In Mauritania, the climate is hot and desert in the center-north, while it is semi-desert in the south because of the summer monsoon, which brings some rainfall between June and early October. On the coast, the heat is tempered by sea breezes, but the climate is mild only in the northernmost part, which is also affected by a cool sea current. Across the country, wind can bring sandstorms. The north (zone 1 on the map) is occupied by the western part of the Sahara desert, where it almost never rains. Along the coast, however, a cold current flows, so much so that the sea temperature reaches a maximum a maximum of 24 °C (75 °F) in August and September in the north. The cold current affects the climate in the northern part of the coast, to the point that in Nouadhibou, the air is often mild or pleasantly warm: the daily average is 20 °C (68 °F) in winter, when there are frequent morning mists, it is still about 23 °C (73 °F) in July, and reaches 25 °C (77 °F) in September, which is the warmest month. However, when the wind blows from the desert, the temperature can rise by several degrees and reach 37/38 °C (99/100 °F) in much of the year (except in winter), but these heatwaves are less intense than in the rest of the country. The months when hot days are more frequent are September and October. Here are the average temperatures of Nouadhibou. Rainfall in Nouadhibou is definitely scarce, since it does not even reach 20 millimeters (0.8 inches) per year. The sun shines all year round, though a little less than in inland areas on account of morning fogs and mists. Here are the average sunshine hours per day. As mentioned, the sea in this northern part of the coast is very cool for much of the year, while it becomes warm enough to swim in from August to October. In the northern inland areas, we are instead in full desert. Here, winter is cooler, with daytime temperatures around 20 °C (68 °F) in January, while the warmest months are the "canonical" ones, ie July and August, with highs around 40/42 °C (104/108 °F). The hottest area is the north-east, where the temperature in summer can sometimes reach 50 °C (122 °F). The rains are definitely scarce. Here are the average temperatures of Zouérat, located in the north, near the border with Western Sahara, and 350 meters (1,150 feet) above sea level. In Zouérat, it almost never rains: in a year, 55 mm (2.1 in) of rain fall, with a maximum of 20 mm (0.8 in) in September. In the desert, the sun shines all year round; however, there is a slight decrease in the sunshine hours in summer, when sometimes there may be some cloudiness. The south-central region is that of the Sahel (zone 2), which, in the summer months, is affected by the northern offshoots of the African monsoon, which brings clouds and rains from the Atlantic Ocean. The Mauritanian capital, Nouakchott, located in the central-southern part of the coast, is warm all year round; in winter, from December to February, highs remain around 29/30 °C (84/86 °F), but nights are cool. In addition, the Harmattan, the dry north-east wind, often blows in winter, carrying dust and sand. In March, the temperature increases, though not as much as in the rest of the country, thanks to the influence of the ocean. However, the daytime temperature rises to 33 °C (91 °F) in June, which is the hottest month. Actually, the temperature can reach 45 °C (113 °F) when the wind blows from inland, which can even cause sandstorms. From July to September, it's the period of the monsoon, which lowers the maximum temperature to 30/32 °C (86/90 °F) but in return it increases moisture, in addition, it brings some rainfall, with a peak in August. However, the influence of the monsoon in Nouakchott is limited, and the rains are still at desert levels. Here is the average precipitation. Even in midsummer, the wet currents coming from the ocean have some breaks, during which the winds from the interior start to blow again, raising the temperature above 40 °C (104 °F). After the monsoon, in the course of the month of September and in October, the temperature increases again, to the point that these are the hottest months, with highs generally around 35 °C (95 °F). Finally, by mid-November, the temperature starts to decline, with winter approaching. Here are the average temperatures in Nouakchott. 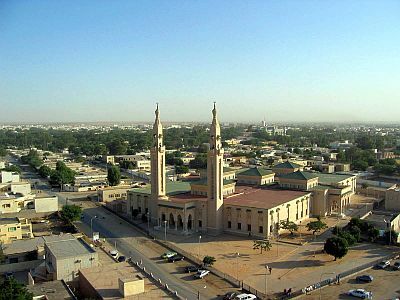 In Nouakchott too, the sun shines all year round, however, cloud banks related to the monsoon can reach this area in summer. The cool sea current has evident effects even at Nouakchott for most of the year, in fact, the sea temperature is about 19 °C (66 °F) from February to May, it is still 21 °C (70 °F) in June, and becomes warm, reaching 26/27 °C (79/81 °F), only between August and October: given that the city is located south of the Tropic, these values are not so high. East of the capital, owing to the distance from the sea, the heat is more intense for most of the year, apart from the winter months. In Tijikja, at 400 meters (1,300 feet) of altitude, the daytime temperature in June is normally about 39 °C (102 °F); annual precipitation amounts to 130 mm (5.1 in). In the southern inland areas, winter is even warmer than in Nouakchott: night-time temperatures remain around 20 °C (68 °F) on the coast and drop to 17/18 °C (63/64 °F) in inland areas, while highs are around 28/30 °C (82/86 °F). Here, the heat begins to increase already in February, and in May, highs of 40/41 °C (104/406 °F) are normal, but the summer monsoon is more intense, so much so that rainfall is between 200 and 400 mm (8 and 16 in) per year. In Néma, 110 mm (4.3 in) of rain fall in August. The combination of moisture and temperature, which remains around 36 °C (97 °F) during the rainy months, makes the heat definitely uncomfortable. Here are the average temperatures of Kiffa, located in the south of the country, 500 kilometers (310 miles) away from the sea. In the far south, along the border with Senegal (zone 3 on the map), the summer rains are even more abundant, so much so that the total is between 400 and 600 mm (16 to 23.5 in) per year. 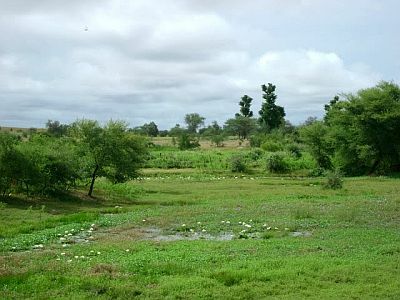 We are still in the Sahel, but in the climatic subdivision called "Sudanese", where even more than 200 mm (8 in) of rain can fall in August, and in the rainy season, the landscape changes, becoming definitely green; in Mauritania, this happens especially in the southernmost region, called Guidimakha. Here is the average rainfall of Sélibaby, the capital of the Guidimaka Region. In the extreme south, winter is hot, and daytime temperatures exceed 30 °C (86 °F) even in December and January. Already in February, the temperature exceeds 35 °C (95 °F), while spring is scorching, but then, the decrease in summer is evident. The best time to visit Mauritania is winter, from December to mid-February: temperatures are hot in the south and mild in the north, the sun shines and it almost never rains. At night, it can get a bit cold everywhere, quite often in the inland areas of the north and rarely in the south, while in the south, it can sometimes be hot even in this season, but more rarely than in the rest of the year. In winter, it's possible to swim in the sea, even though the sea is a bit cool, and sometimes, the air can be cold, at least at night and in the early hours of the morning. 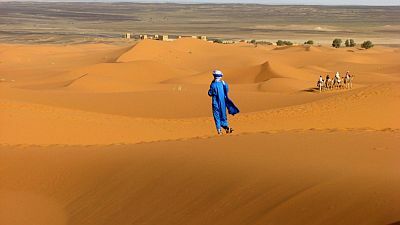 In winter: for the inland areas, bring light clothing, long and loose-fitting shirts and pants, a scarf for the sand and dust, sunglasses (even graduated instead of contact lenses), a jacket and a sweater for the evening, especially in the north, and desert boots or sandals; for Nouakchott and the coast, light clothes for the day, a sweatshirt and a jacket for the evening, and a scarf for the sand. In summer: bring lightweight clothes, long and made of natural fabric (cotton or linen), a desert turban, a sweatshirt for the night, a sleeping bag for night outdoors. On the coast north of Nouakchott, a light sweatshirt; for the south, a light raincoat for the rain showers. It's better for women to avoid shorts and miniskirts.